Beautifully written meditations on fifteen well-chosen words In What’s in a Phrase? — winner of the 2015 Christianity Today Book Award in Spirituality — Marilyn McEntyre showed readers how brief scriptural phrases can evoke and invite. 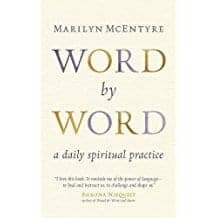 In Word by WordMcEntyre invites readers to dwell intentionally with single words — remembering their biblical and literary contexts, considering the personal associations they bring up, and allowing them to become a focus for prayer and meditation.